Near TPC Pkwy. Final Opportunities - Act Now! 1 Move-In Ready Homes Available! This is an elegant 2721 sf new 1 story design that features 4 bedrooms and 3.5 baths with an optional 3 car garage available. It features a gourmet kitchen with 42” upper cabinets and a large arched granite island that is perfect for breakfast or any meal. The kitchen includes stainless appliances with an optional gas cooktop. This home has a “Mother-in-Law” guest suite, beautiful 18 and 20 inch tile floors, large covered patio, spacious master bath with large walk-in closet, and showcases a full “Smart Home” security system, and more! A home design that’s hard to find! Customize your floorplan and imagine furniture placement with our Virtual Floorplan tool. The Park at Steven’s Ranch is a master planned community on the West side of San Antonio. Located at the northeast corner of Highway 211 & Potranco with quick access to US90, I10 and 1604. The Park features a community pool and a recreation center. The Park at Steven’s Ranch is a master planned community on the West side of San Antonio. Located at the northeast corner of State Highway 211 & Potranco Road with quick access to Loop 1604, US 90 and I-10. The Park features oversized oak studded lots, a community pool and a recreation center located within the neighborhood. Come see these beautiful large home sites and community amenities. 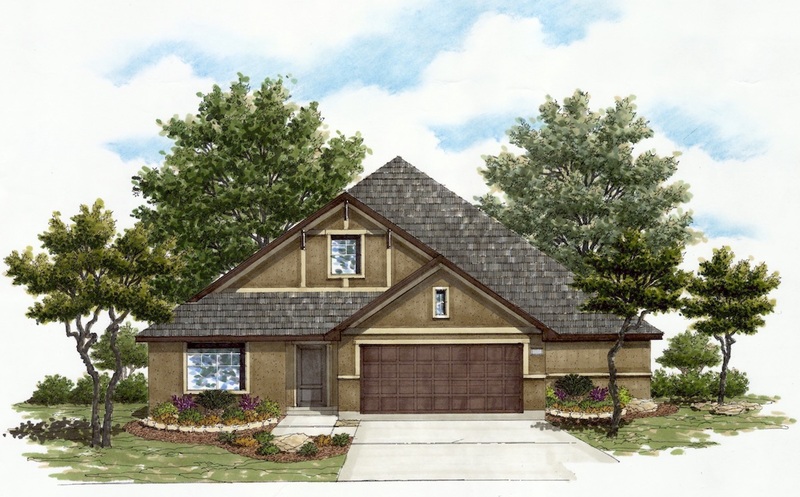 Texas Homes if offering spacious one and two story plans from 1,977 to 3,748 square feet. These beautiful homes feature plans with volume ceilings, 2 to 3 car garages and can be modified to fit your family's lifestyle. There are many options available for you to choose from including gourmet kitchens, oversized showers, media rooms and home offices. Texas Homes is also proud to offer our home buyers a design center in which you can truly customize the home of your dreams. The Park is served by the Northside Independent School District, NO CITY TAXES! Come discover what The Park at Stevens Ranch has waiting for you! The schools for The Park at Steven's Ranch are Robert Langley Elementary School, Bernal Middle School, and Harlan High School. Please note: Many upgrades and options are included in the base price of the homes we offer. These additional features vary according to each community’s specifications and are not represented on the floor plans displayed on this page. For specific details please consult with your Texas Homes Sales Counselor. Floor plans may vary by elevation. Prices shown reflect the base price of the home according to community specifications and elevation and are subject to change without prior notice or obligation. The square footage is an approximate number and may vary depending upon the method used to calculate the measurement. All elevations and floor plans are an artists’ conceptual drawing and may vary from the constructed home. Texas Homes reserves the right to make changes to the home, plans, and specifications as we deem necessary without notice or obligation. Floor plans may vary by elevation. Every Texas Homes-built home is a part of a unique, thoughtfully-planned neighborhood, and customized for each homeowner's needs. We bring together quality craftsmanship, approachable design processes, and harness the latest home automation technologies to bring to life the ideal house to call your home. Our homes are built by Texans, we're owned by San Antonians, and are proud to serve Texans and future-Texans like you. Receive offers and news about neighborhoods and move-in-ready homes.